Steep tussock slopes on the south side of Niger Stream lead out to the ridge between Niger and Fog Peaks. 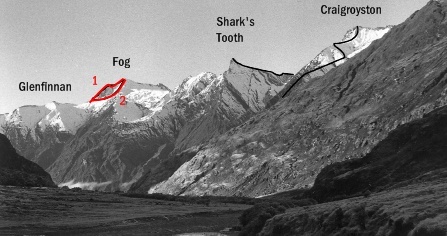 Fog Peak may be reached, either by traversing the rock ridge to the summit, or by cutting out on to the snowfield on the South Face. This is a long climb from the road and would probably take about eight hours to the summit. From Glenfinnan Peak the straightforward rock of the North Ridge leads to the summit ridge some 200m north-east of the summit. The West Ridge is reached by crossing the North Ridge between Glenfinnan and Fog Peaks and traversing on suitable ledges across the steep North Face of Fog Peak until the West Ridge provides a straightforward route to the summit. To be climbed comfortably, this route would probably require a camp near Glenfinnan Peak. Paul Powell & Geoff Baylis, 1963. This stunning flow is easily reached using a helicopter and then skiing out down the Leaping Burn. It is at the head of the East Branch of the Polnoon Burn on the south-eastern slopes of Fog Peak. The name is in recognition of the Heli ski guides who passed on the location of this classic line. The first pitch climbs 80º stepped ice, ending in an ice cave large enough to shelter four people. The second pitch erupts out of the cave and onto a 40-metre pillar. 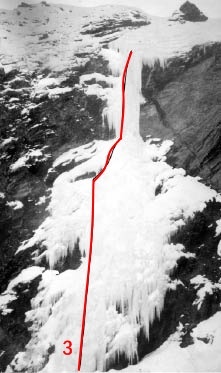 If the left hand side is climbed, the grade is WI3+ on 85º stepped ice. If the right side is clung to then vertical grade 5 climbing can be expected. On the first ascent the left-hand side was climbed.